When staying in Bakersfield the default hotel for me has been the Buck Owens Best Western as it’s the SBR usual. John suggested the Quality Inn just down the road. Accommodations were just as good with a breakfast included as well. At $65/night for two people the price was right and didn’t include roaches as well. 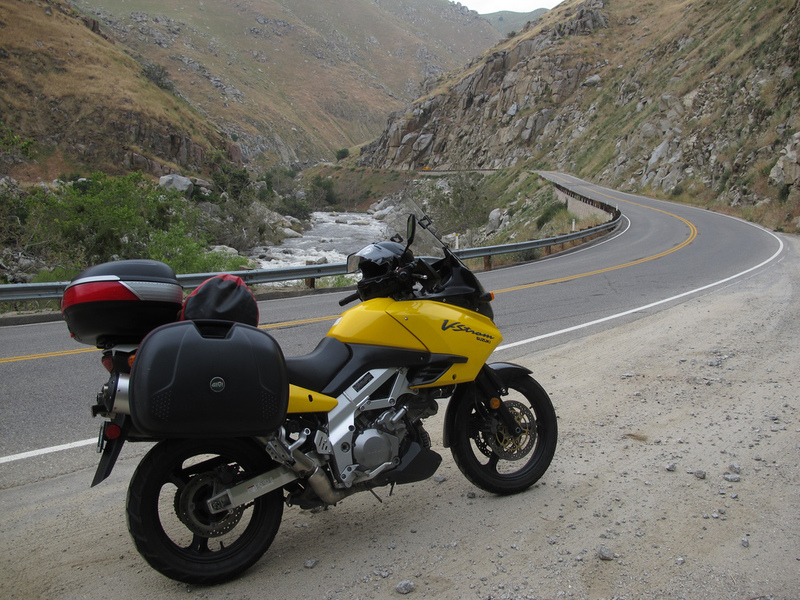 One of my favorite rides in this area is CA-178 through Kern Canyon from Bakersfield out to Lake Isabella. I can remember the first time coming through this area the fields were lush from the winter’s rain and the valley was covered in bright green foliage. Given that it was near May, things were much more brown this time. 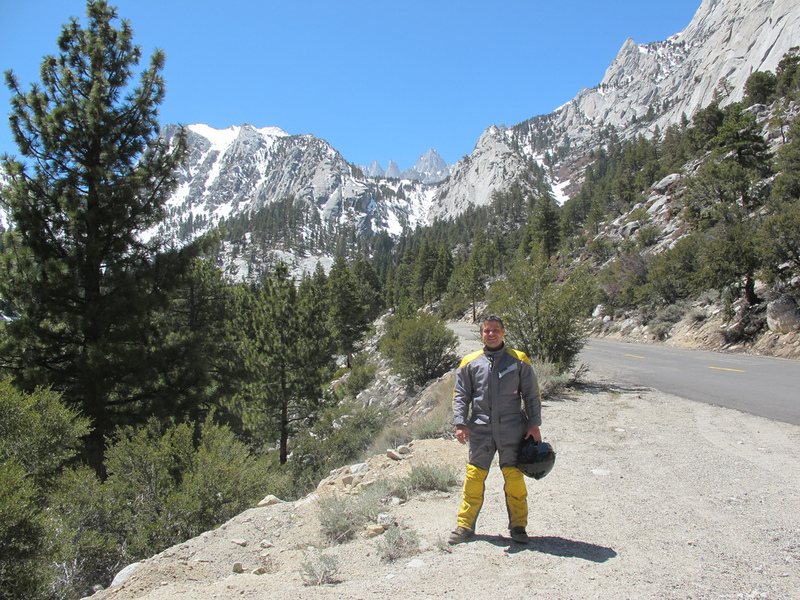 The ride starts out with very technical canyon carving and then mellowing out into high speed sweepers. After meandering around Lake Isabella 178 continues it’s path east into drier country as the Sierras fade into the desert. 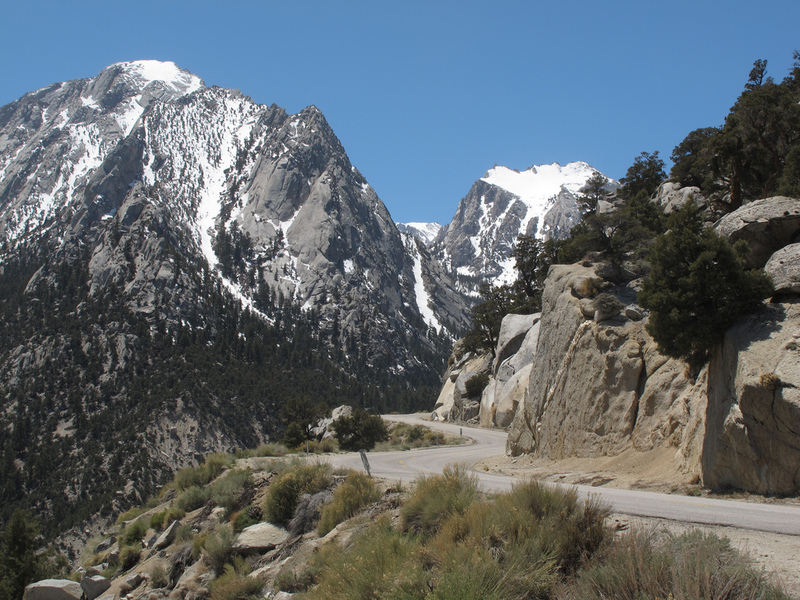 One of the last major bumps is Walker Pass. Joshua Trees aren’t all that common in Death Valley but there are a few of them that do pop up from time to time along the route to the park. 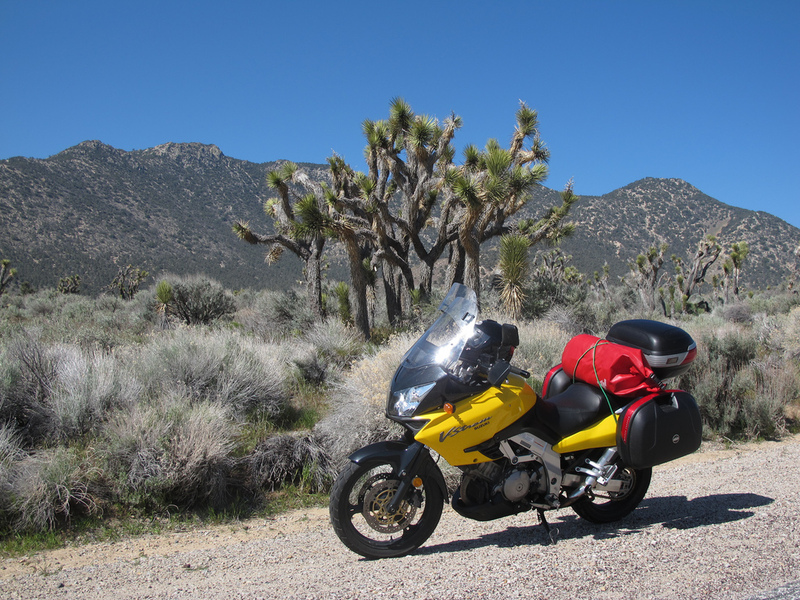 As we were riding along US-395 out to Lone Pine, the wind was really starting to pick up. The national weather service issued some wind warnings. Looking off to the east you could see the “brown cloud” that covered Death Valley. I had no real interest in getting sand blasted. Fortunately the wind was supposed to abate after lunch. So now the task was to find something to do between now and lunch. 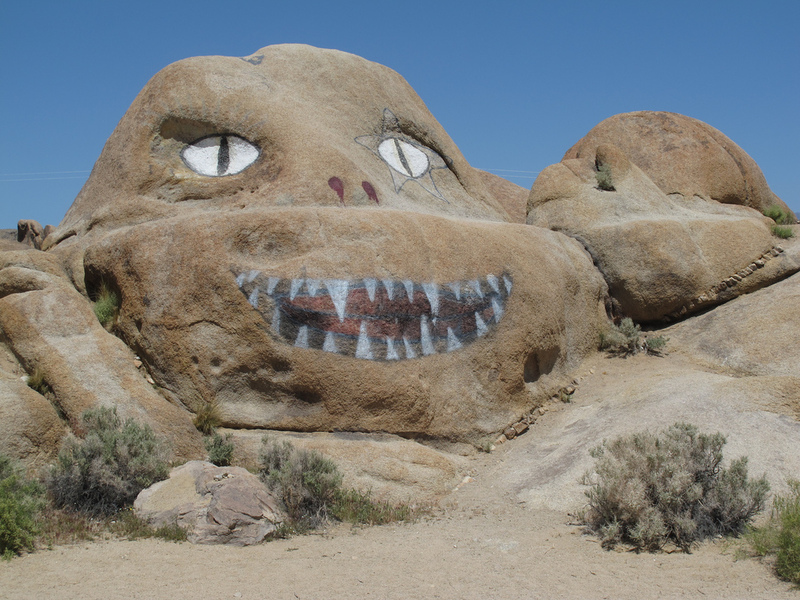 John had suggested we go see the Alabama Hills along the Whitney Portal Road. I’d not been that way before so why not. We came upon some interesting local artwork on one of the rocks! I was looking to buy some more time and have a soft spot for snowy mountain peaks so I was curious to see how far the road went back. It’s kind of cool that the highest and lowest points in the US are so close to one another. I’m guessing they are only 150 or so miles apart. The road was nice and twisty and up the mountainside. At the parking lot for the hikers there was quite a bit of ice. You can see the top of Mt. Whitney in the background. It’s the highest peak in the continental US at 14,505 feet. Mt McKinley takes the cake for North America coming in at just over 20.000 ft.
I’m guessing we were about 6,000 feet in elevation at this point. Lone Pine and the Owens Valley are below. You can faintly see Owens Lake off to the right in the photo. What has continually amazed me about the western part of the US is how far things are between each other with nothing in between. Growing up back east there is just more stuff around: small towns, gas stations, houses, etc. Out here there’s just open land sometimes with nothing in between stops. The ride into Death Valley is no exception. It’s a fun ride as with little services there’s also little supervision, but if and when the bike has issues, it’s a long walk out. 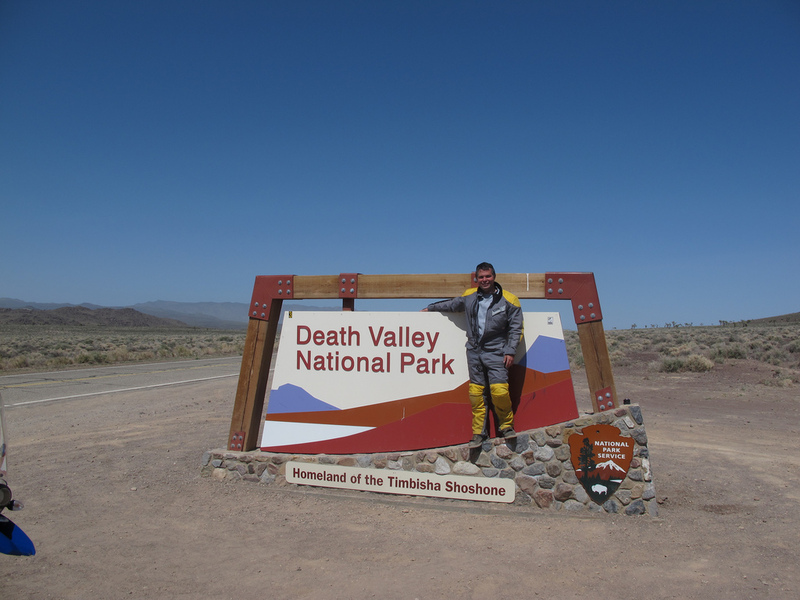 After more than a few miles of high speed riding we finally touch down in Death Valley. Both John and I had been to Death Valley before so we didn’t stop and spend time at a lot of the major attractions in the park. We needed to get some information on Eureka Dunes so we wanted to stop at Furnace Creek to check with the rangers down there. 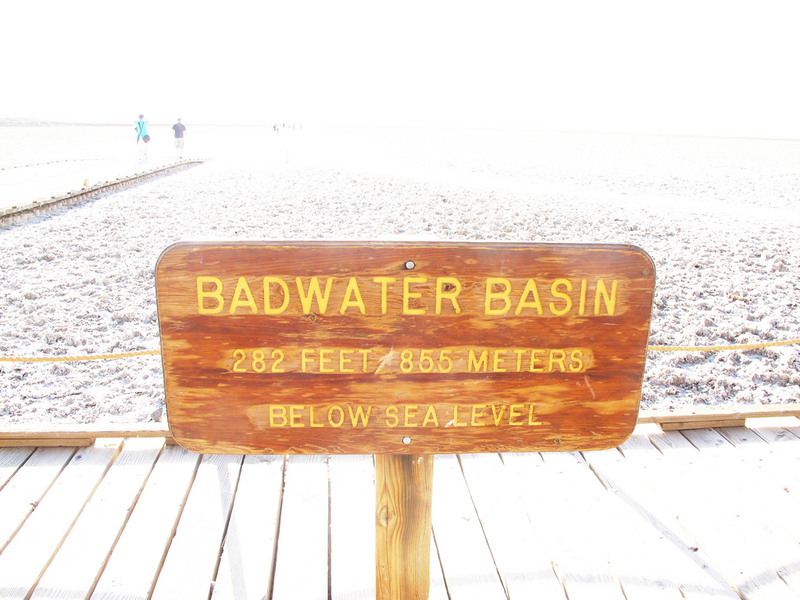 Since we had to go down that far, it was worth a stop at Badwater Basin and the Artist Palette as well. 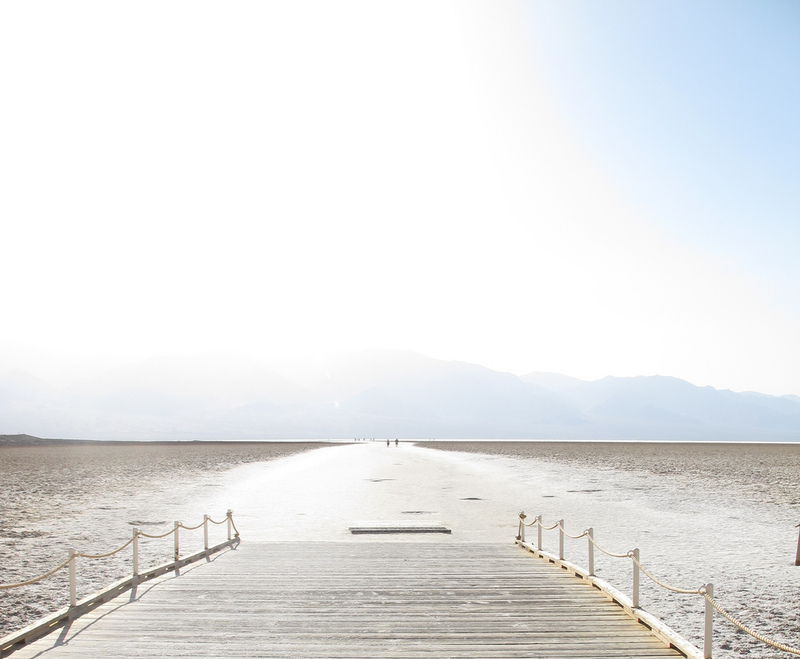 Badwater basin is the lowest point in North America checking in at -282 feet. The mineral deposits extend from the bridge almost like a path across the basin. The other interesting spot to stop along Badwater Road is the Artist Palette. 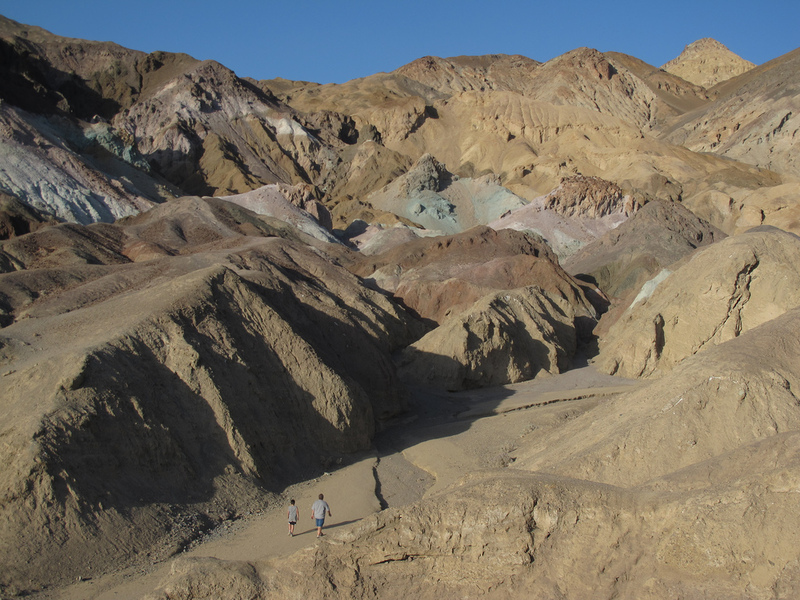 It’s one of the few places in the park to see geologic color that’s not brown or some other color in the neutrals. The road through the display is a one way path which makes it nice as you don’t have cars coming the other direction whom are not paying attention to you. We camped at Stovepipe Wells. 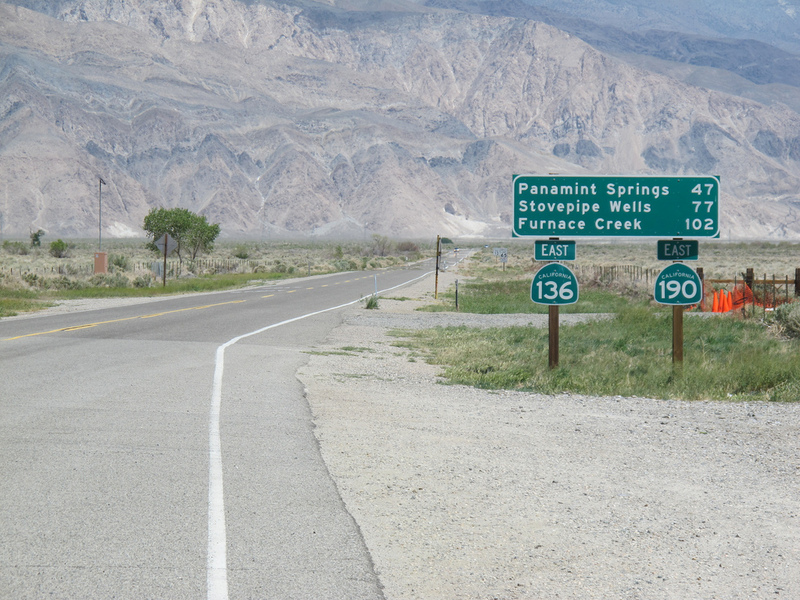 Having stayed at Furnace Creek a number of times, Stovepipe Wells was always an afterthought. The company that runs Stovepipe Wells, Xanterra, sold off Stovepipe Wells to another company. That company has since put some money into making Stovepipe Wells much nicer than it was, but at a much lower price point than Furnace Creek. Motel Rooms were in the $100 range vs the $200 range for the same room at Furnace Creek. John wanted to camp to hear the Coyotes howl as he had on a prior trip to the park. Remember that wind? We did get a reprieve for the afternoon. As we got to the campsite the wind picked up again big time. The campsite was near empty. The ground was hard as rock. Tent stakes weren’t going in the ground. I let go of my tent to get my sleeping bag and the tent went end over end as the wind carried it over three campsites. The wind blew mercilessly all night long. As for the coyotes? I think they were having beers down Furnace Creek. We didn’t hear a single one!